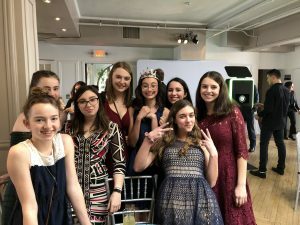 Throughout the school year we often get photos from camp families of our Runoia girls getting together outside of camp. 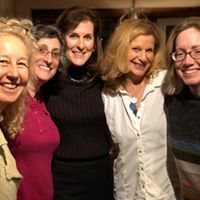 The power of camp friendships is very strong and often travels great distances for a hug and to reconnect. Family vacations might be planned around the location of a camp friends home and as girls get older they may head off alone on an adventure to see their camp people. I recently had a weekend, whirlwind trip to NYC with my 13 year old daughter. 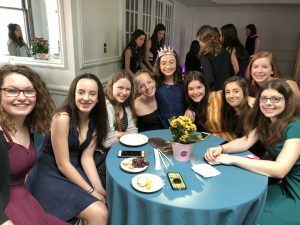 We had been planning it for over a year as a camp friend was celebrating her Bat Mitzvah. The girls have been full season campers together since they were small and have a strong bond. 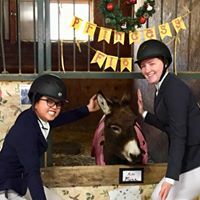 Even though they may not typically see each other through the school year their friendship reignites once camp rolls around. It was with much excitement that we planned the journey from Maine, fancy outfits and dress shoes packed as we travelled in snow boots and parkas! Camp friends made up a large chunk of the kids present at the party. It was amazing to see that our Runoia parents recognized the value of these summer relationships and the importance of sharing non camp special events together. They had made a huge effort to get their girls to NYC. For some it included traveling long distances some of it through a snow storm and also other camp families hosting sleepovers and helping with transportation. The love and joy in the room was palpable, the hugs and bright smiles just continued all afternoon. New memories were made in a radically different venue with heads bent close together in deep conversation, wild dancing on the dance floor and of course sad goodbyes at the end. I often tell prospective parents to make their choice wisely and try and help them to understand that their commitment is not just to the next 5- 8 summers but also to all of the in between times. 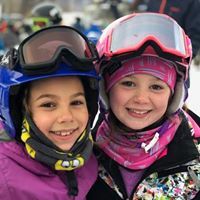 Runoia girls love to hit the slopes and often spend time together at Sugarloaf. Maine mountains are as great as Maine camps. Personally it was such a treat to spend non camp, social time with our girls , an added bonus was seeing the younger and older sisters of those invited and of course our awesome camp parents. The Runoia community is truly a large family, we show up for each other and celebrate all that we individually are. Our Camp Runoia alumnae also love getting together and have spring gatherings coming up. March 31st in Boston and April 7th in DC. It is a great opportunity to share camp stories and fellowship. It really doesn’t matter what years you were at camp or if you even know the other women attending. The spirit of Camp Runoia transcends the generations and the connections, traditions, songs and stories are common to all.